I love coffee and what I might love more than coffee is coffee shops with a bit of style and beauty. 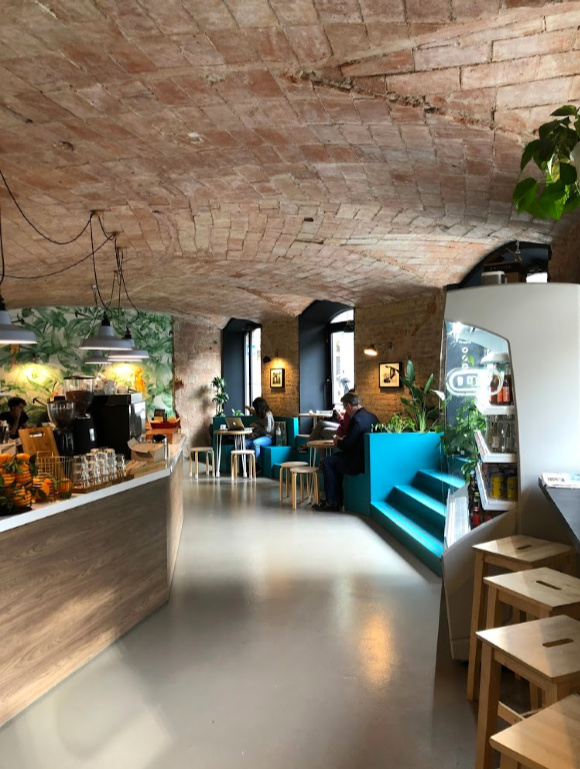 There are plenty of places to get coffee in Barcelona, but here are a few of my favorite coffee shops in E’ixample for those of you that enjoy the space as much as caffeine. This one is new to the neighborhood and happens to be a few doors down from our veterinarian. The adorable turquoise bike and black and white tile floors caught my attention, as did the beautiful baked goods that are always on display in the window. It’s small but elegant and has plenty of light. This is one of my favorites because it’s right around the corner and has the traditional Catalan style curved ceilings, making it feel a bit like a hidden cave. The botanical wallpaper also makes me happy. I am a sucker for botanical anything and glad that trend is still going strong. 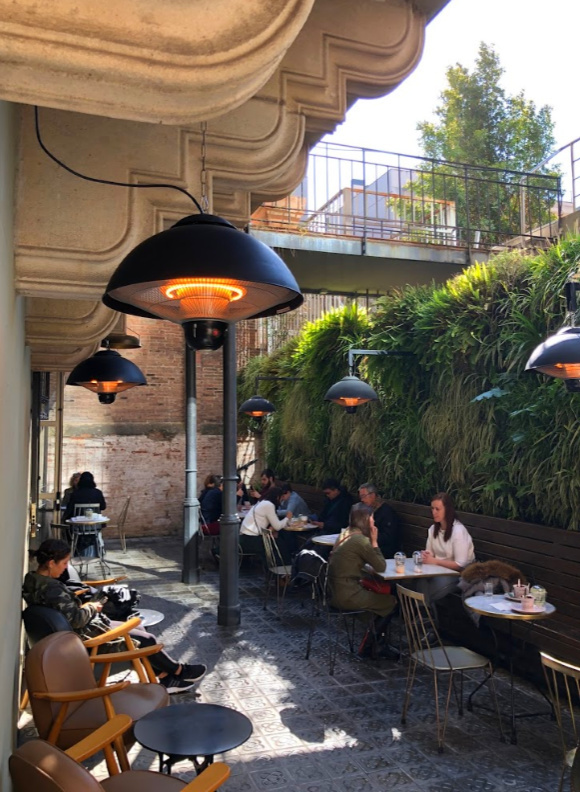 Not only is this a fantastic cafe for coffee and picking up a quick breakfast, but they also have a variety of salads and ligher lunch options as well. Possibly one of the most beautiful ceilings you will ever see in a coffee shop. The Pedrada Cafe is the cafe for Antoni’s Gaudi’s La Pedrada or often called Casa Mila. 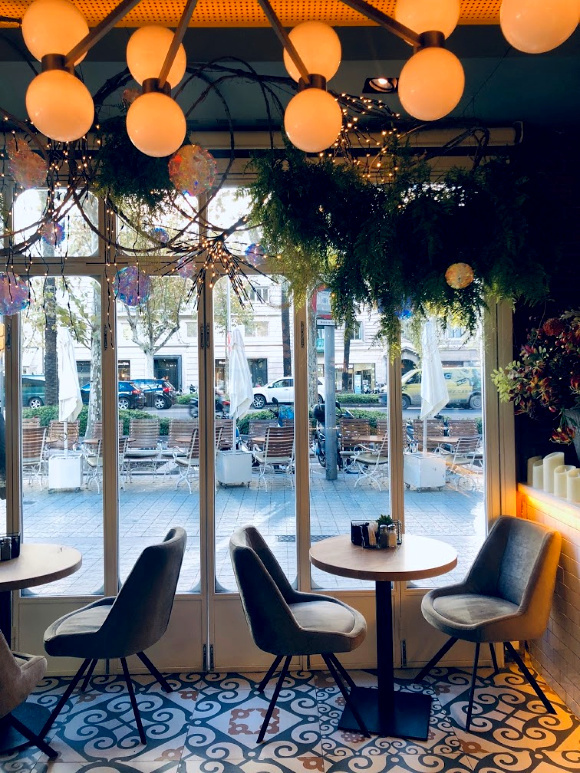 This cafe sits right on Passeig De Gracia and is simply gorgeous. If you are visiting La Pedrada be sure to grab a coffee or a glass of wine in the cafe afterwards. A beautiful and bustling cafe for busy professionals in Barcelona. 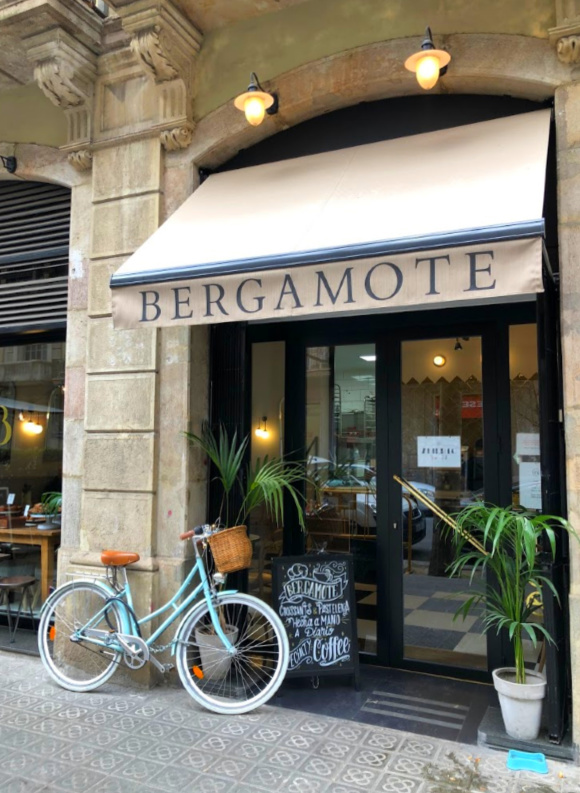 Located on one of the main streets in Barcelona, Avinguda Diagonal this cafe is a great spot to meet for a morning coffee or lunch. I meet friends here that live on the other side of town becasue its a great place to meet in the middle. This cafe is large enough to seat many and there is plenty of outside seating as well. 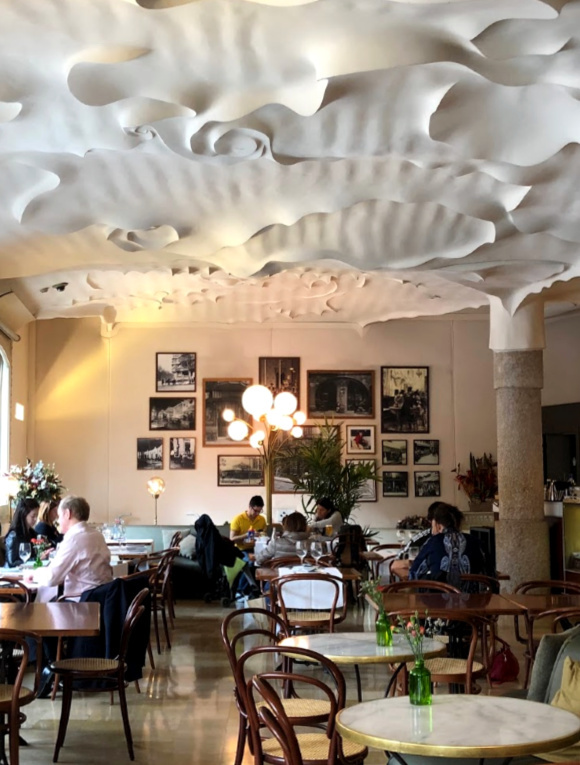 This cafe is a bit of a hidden gem, and easy to get lost in the shuffle of people outside Casa Batlló and Casa Amatller. Casa Amatller is designed by Josep Puig i Cadafalch and was the residence of the famous chocolatier Antoni Amatller. In the very back of Casa Amatller is the Faborit cafe that has a really nice terrace tucked away from the crowds. It may look like this is only for those touring Casa Amatller, but it is open to the public. Don’t worry, I have plenty more coffee shops to share! Hello! 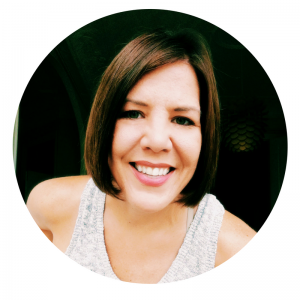 I'm Andrea Fellman, an American mom living in Barcelona with her husband, two kids and two dogs. This is my blog where I share our family's travels, life as a creative entrepreneur and our adventures living the international lifestyle. Buena Vista Lodge: Water slide through the rainforest!